Grindmaster-Cecilware's MT2ULBL frozen drink dispenser is designed to make merchandising and selling cold or frozen drinks simple. The two clear bowls and lighted graphics panels catch potential customers' eyes, while the black exterior finish ensures the machine will fit in with any décor. Each bowl holds 21⁄2 gallons of drink, limiting how often you will need to worry about refilling the mix. 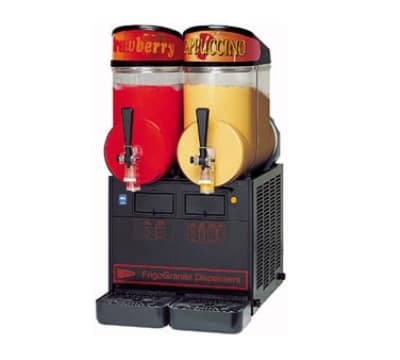 This machine can serve cold or frozen drinks, as each bowl has separate controls that allow you to set the perfect temperature for your drink. With easy pull-down lever dispensing and quiet operation, this machine is ideal for self-serve operation. In addition to being easy to operate and merchandise, this equipment is also very easy to clean and maintain. Most major parts, including the bowls, augers, seals, faucet assemblies, and drip trays are all removable to make cleaning and sanitizing simple. The air filter is also removable for cleaning, and the filter indicator light lets you know when this needs to be done. The magnetic drive system means fewer seals to wear out and less chance of motor burnout, so you will need less maintenance and service over the life of your equipment.